Titanium is the 22nd element of the periodic table. These titanium facts contain chemical and physical data along with general information and history. Reverend William Gregor was an amature geologist who found a grainy, black sand in a stream near his parish of Mannacan in Cornwall, England. Further investigation showed the sand was part iron, part some unknown metal. He named his new metal manaccanite after his parish. He reported his discovery to the Royal Geological Society and moved on to other things. Four years later, German chemist Martin Klaproth believed he found a new metal in the mineral rutile. He named his metal titanium after the Titans of Greek mythology. Klaproth learned of Gregor’s discovery and found Gregor’s manaccanite was identical to his titanium. Name Origin: Titanium is named after the Titans of Greek mythology. Natural scandium is comprised of five stable isotopes: 46Ti, 47Ti, 48Ti, 49Ti and 50Ti. Twenty one radioactive isotopes exist ranging from 38Ti to 63Ti. Titanium-46 is a stable isotope containing 24 neutrons. 8.25% of natural titanium is titanium-46. 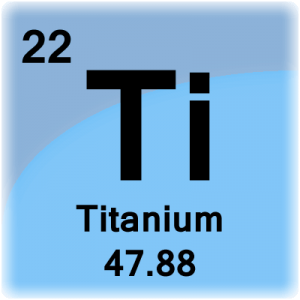 Titanium-47 is a stable isotope containing 25 neutrons. 7.44% of natural titanium is titanium-47. Titanium-48 is a stable isotope containing 26 neutrons. 73.72% of natural titanium is titanium-48. Titanium-49 is a stable isotope containing 27 neutrons. 5.41% of natural titanium is titanium-49. 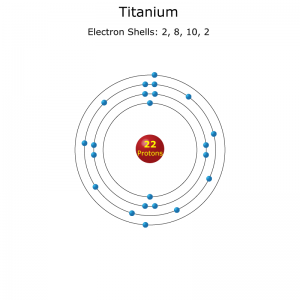 Titanium-50 is a stable isotope containing 28 neutrons. 5.18% of natural titanium is titanium-50. 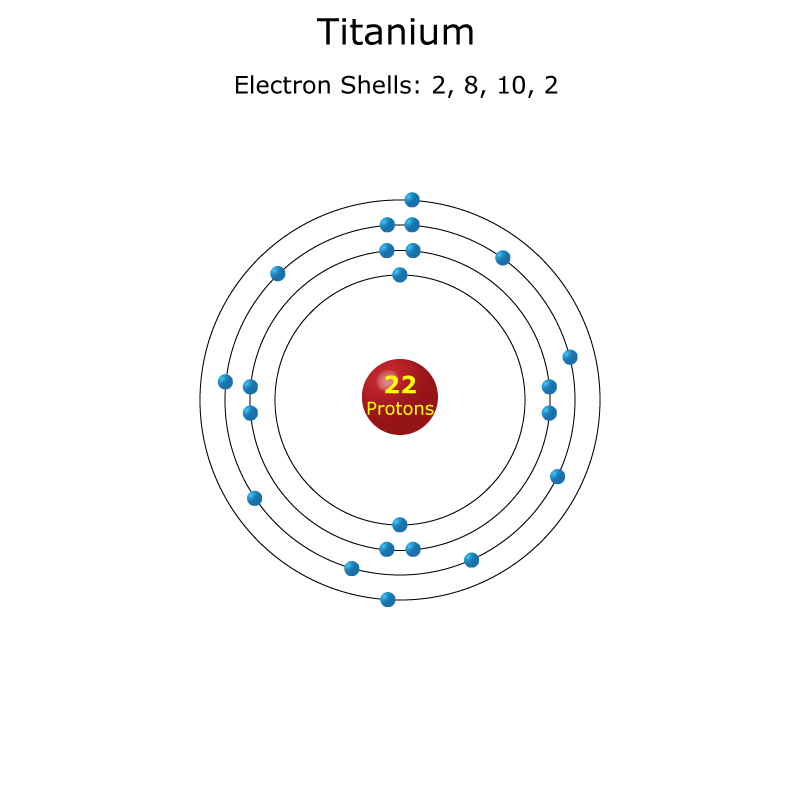 Electron shell configuration for titanium. Titanium is a hard, shiny, strong metal at room temperature. 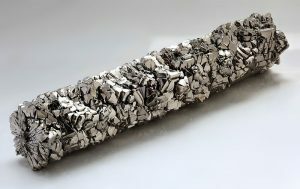 Titanium is used in many alloys. Titanium has the largest strength to density ratio of all the metals. Titanium adds high temperature resistance to alloys in addition to lightweight strength. Titanium resists corrosion. Titanium is used to protect the hulls of ships and submarines from seawater. Titanium is used in joint replacement surgeries because titanium bonds well with bones and is non-toxic to other tissues. Titanium is the ninth most abundant element in the Earth’s crust (0.63% by mass). Pure titanium proved difficult to isolate. Pure titanium metal was not produced until 1910 by New Zealand metallurgist Matthew A. Hunter. 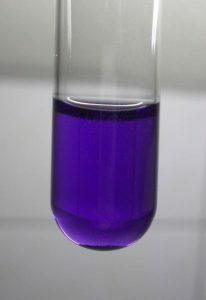 Titanium(III) compounds are often violet in color. One of the largest uses of titanium is in paint. Titanium(IV) oxide (or titanium dioxide) in paint makes a bright white color. Titanium(IV) oxide is used in sunscreen products. Small particles of titanium oxide are invisible on skin but block UV light. Titanium is a relatively inert substance. This makes it ideal for hypoallergenic jewelry to be made from titanium.